Disney is preparing to send you on a wonderfully blissful journey through the glowing rivers of Pandora – The World of Avatar. Enter the Na’vi River Journey, one of two signature rides in the new expansion at Disney’s Animal Kingdom. Walt Disney World granted ITM access to enter this ride early today, a month ahead of its official debut on May 27. The results are breathtaking. In a serene boat ride through a bioluminescent forest, we set eyes on some of the Na’vi, incredible animal species, and beautiful foliage. The queue begins on a path that winds its way around various textiles created by the Na’vi as well as their totems of the magical Shaman of Songs. The pieces are intricate works of art and give you a taste of the fascinating people you are are about to see. Above the queue is another intricate hand-woven piece that actually serves as a map of the river that winds through Pandora. The blue ropes represent the river, and the other areas represent the rest of the bioluminescent forest. At night, this piece takes on new life as it is illuminated with light that moves, showing where various life forms are as they journey down the river, according to Executive Creative Director Stefan Hellwig. Once inside, a simple boarding area allows you to enter boats with two rows that sit three people each, and your journey begins. The entire experience is only a couple minutes, but it is a stunning sight full of spectacular color and curious creation. Imagine spinning discs, floating jellyfish, and sea anemone out of water and you may begin to touch on the wonder of it all. Na’vi are seen throughout in scenes where they are hunting and gathering. Native wildlife like the strangely beautiful viper wolves peek out to see you as you float by them, and there is an actual sense of magic that builds. However, just when you think you have seen it all, you turn a bend to find a creature so real that it blows your mind. 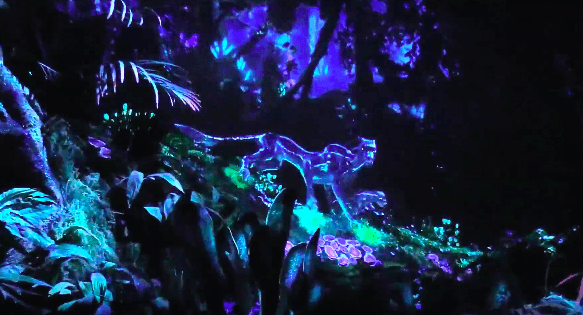 Up to this point in the attraction, all of the creatures you have encountered (including the Na’vi) have actually been presented on layers of screens that are positioned inside beautiful sets. The sights are impressive, but they are projections nonetheless. In the attraction’s final scene, though, we are treated to a rather climatic encounter. Sitting and singing, the Shaman of Songs is the most fantastic animatronic on Walt Disney World property to date. Her fluid movement is so realistic that it is actually scary on some level. You feel a bit as if this piece of Imagineering has seen into your very soul. It is mesmerizing as your brain tries to discern whether this is the bit of robotic genius that you know it is or if this is actually fantasy come to life with actual DNA. In the previous portions of the ride, you are anxious to move forward. You know there is more to see, and you can hardly wait to take it in. This mood shifts when you reach the Shaman. Suddenly, you don’t want to go any further. You want to linger. You wish the boat could be anchored so that you could sit in the presence of this amazing creature right in front of you. This is the magic of the Na’vi River Journey–a journey of spectacular beauty and pure serenity. Get ready to meet the Na’vi when Pandora – The World of Avatar officially opens to the public on May 27 at Walt Disney World. And check back with ITM on May 12 when we return for another preview of this highly-anticipated theme park expansion! Planning a trip to Pandora? Get discounted tickets to Disney’s Animal Kingdom from our sponsor Maple Leaf Tickets.